It can also be stored without refrigeration, on the shelf for about a year if airtight to keep moisture out and prevent oxidation. Trick your friends and try it on your next meal that you usually use butter with and see if anyone notices. Butter without the dairy is a way to put it. Butter is slowing simmered to cook out the water and milk solids. The milk solids, namely the protein casein, and the carbohydrate lactose, are what most people are sensitive to. It is sometimes called Clarified Butter. What remains is a less-diluted, golden spread with a rich buttery taste and aroma. 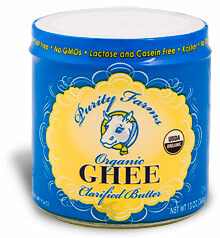 Also, since the milk solids and water are removed, Ghee has a higher smoke point, which means you can cook at a higher heat and use it for deep frying, sautéing or stir frying your favorite meats and veggies, if you’re in the mood for that type of thing.